As fans impatiently await the arrival of the final Phantasm film, Phantasm: Ravager, Well Go USA has debuted a brand new poster. This one-sheet teases the "final game" played by the iconic Tall Man, as fans get ready for the release in limited theaters on October 7. It isn't known how many theaters it will play in, but it will also be released on Digital HD that same day, along with Phantasm: Remastered, a high-definition remastered version of the original 1979 classic, that was overseen by director Don Coscarelli and J.J. Abrams. 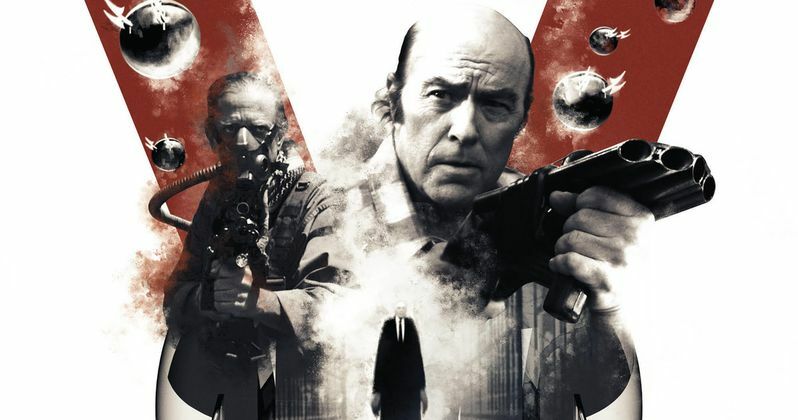 Phantasm: Ravager is an all-new film that brings one of cinema's longest-running franchises (36 years!) without a reboot to a close, with Mike (A. Michael Baldwin) and Reggie (Reggie Banister) teaming up to confront the dimension-hopping Tall Man (Angus Scrimm, in his final role) once and for all. Angus Scrimm passed away in January at the age of 89. He had already long completed his work on the film, which wrapped principal photography back in March 2014. Well Go USA picked up the rights to both Phantasm: Ravager and Phantasm: Remastered back in July. Phantasm: Remastered will screen across the county as part of the inaugural Art House Theater Day on September 24, and Phantasm: Ravager will be released in select theaters on October 7th, day and date with its digital HD release. In addition, fans across the country will have the ability to bring both films to their hometowns using Tugg, an innovative platform that empowers individuals and groups to host screenings in their local theaters and community venues. Well Go USA will also release never-before-seen restorations of Phantasm III: Lord of the Dead and Phantasm IV: Oblivion. While Phantasm: Ravager will be the final installment of this horror franchise, it will also be the first that will not be directed by Don Coscarelli. David Hartman, best known for his work on animated TV shows like Transformers: Prime and Roughnecks: The Starship Troopers Chronicles, takes over as director. The filmmaker co-wrote the script with Don Coscarelli, with production taking place in secret throughout Southern California for two years before they wrapped in March 2014. J.J. Abrams helped oversee the 4K restoration of the original Phantasm, which even inspired a small part of his blockbuster Star Wars: The Force Awakens. The filmmaker admitted in an interview that the character Captain Phasma, played by Gwendoline Christie, was an homage to Phantasm, since it is one of his favorite movies. Take a look at the new poster for Phantasm: Ravager to get ready for the October 7 release.